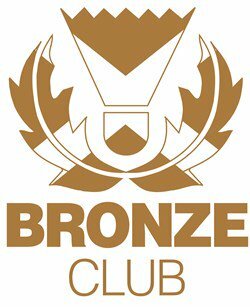 Perth Junior Badminton Club was recently accredited with the Bronze Club award in BADMINTONscotland’s new club accreditation initiative Shuttlemark. The programme aims to help support and develop clubs in order to increase participation in the sport and involves three levels – Bronze, Silver and Gold – each of which have seven key requirements that must be met. Increasing participation, developing coaches, volunteers and workforce whilst having solid plans for the future are key to a club’s success and BADMINTONscotland want to recognise, support and reward the dedicated volunteers within clubs that are striving to make this happen. 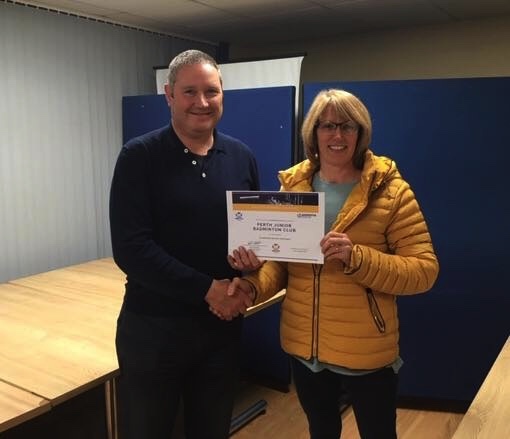 Perth & District Badminton Association Secretary and Junior Club Secretary, Aileen Travers, collected the award from Badminton Scotland Chief Executive Keith Russell.